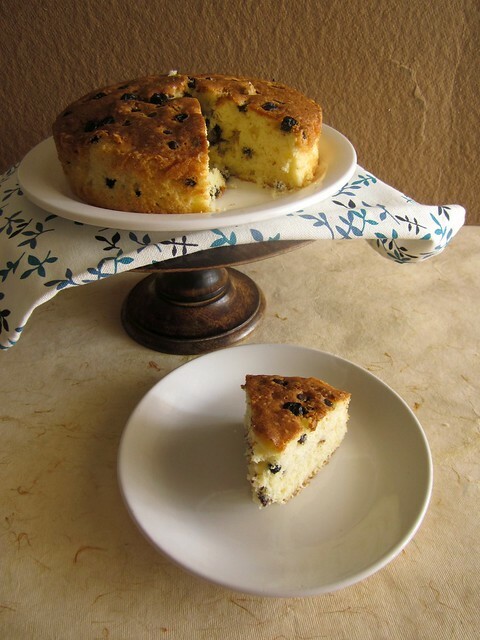 Easycooking: Blueberry Choco-chip Tea Cake & A Giveaway! Hello Divya! Thanks to your blog, I started baking with your cookie and cupcake recipes. Now I am a fairly confident home baker although the journey has just begun and it is a long way to go... 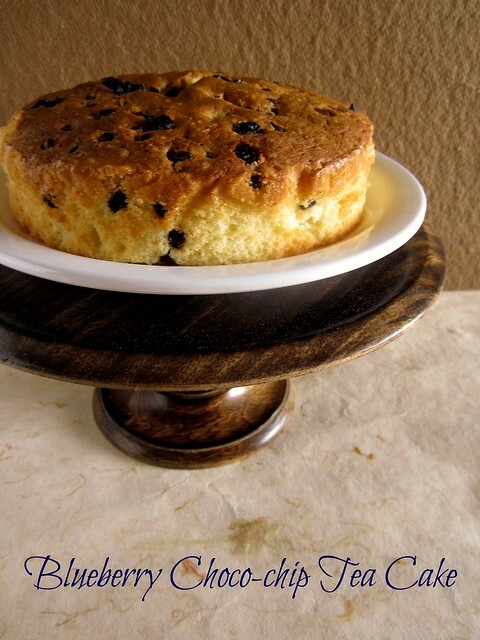 I loved your Nankhatai and pound cake (mango, coffee-chocochip) recipes. I have made this multiple times and many people whom i have suggested have made this too. Always works. P.S Please make more cake/cookie recipes that are eggless and can be made in microwave. Hey Divya, Congrats on the Big 5. I have been following your blog from a long time when i was new to the whole blog thing and i must have tried up all the dosa and chutney recipes from your blog. But now my fav from your blog is the eggless bakes u post, u have more than 70+ recipes in that and i am on the way of trying it as many as i can. I got an interest in baking cakes, on seeing your website since I too have only microwave oven with the facility of baking and not a separate convection oven. I first tried a chocolate cake, which was a total flop and then I tried your moist butter cake (http://www.divyascookbook.com/2010/05/moist-butter-cake.html) and it was a big hit! Yes, I made it almost 5-6 six times during the last Christmas time. tea time cake looks very simple, spongy and yummy. Woww... this looks absolutely perfect and inviting.. awesome step by step pics too..
Congrats Divya, and wat an incredible cake to celebrate, cake looks simply spongy and super soft..
Cake looks gorgeous,,,:) happy blogversary,..
Congrats Divya. all your baking recipes rock. Congrats on your blog turning 5 Divya, and i would love-love-LOVE to win that book!! My favourite recipe would have to be your death by chocolate cake - yummy and oh so chocolaty! Congrats Divya. The cake looks soft and delicious..
lovely photos divya stunned :) shows ur passion towards baking ! i loved all the recipes in your blog :) esp the review about the hotels and website ! This is the one blog I turn to for any eggless baking ideas. I have tried many of your eggless cakes and its been enjoyed by all at home. Thanks for sharing all these wonderful recipes! I have been following your blog for sometime. I like the step by step instructions. My favourite recipe is the Death by Chocolate cake. I made it and was a great hit. Easy Cooking was one of my inspirations for baking.. I should admit that.. And you had always cleared all my doubts and that did take me a step ahead in baking :) May many more years go by and keep posting ur wondeful recipes for all of us to enjoy :) :) And my all time fav is Blackforest cake !!! The Nankatai recipe is a close second.. Fingers crossed.. Hope I win this one. Your cake looks so good, calls my name! Happy anniversary and wish you many many more! A fav recipe from your blog? Masala biscuits! Congrats on completing 5 years of your blog.. Oh yes I am an avid follower of your blog..Your Chocolate Fudge Brownie is my most fav recipie.. Tried it twice and was a big hit..
Congrats on the blogs 5th birthday!!!! 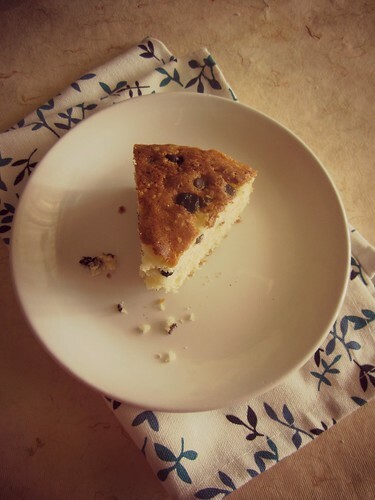 I love browsing through your blog and have tried most of the cake recipes you have posted..
Congrats! I do wish that your blog gets going great as ever. I would be totally lost if you ask me which is my favorite from your blog. I have successfully tried so many of your recepies and have become a confident home-baker. I would pick up your "death by chocolate cake" the best as it is a dream for me to bake one of that kind in my own kitchen. my favorite recipe on your page is Egg less Black Forest Cake which i baked 1st in ma oven n was good.Ur baking section is well arranged n is very helpful. Hi Divya.Very yummy cake. 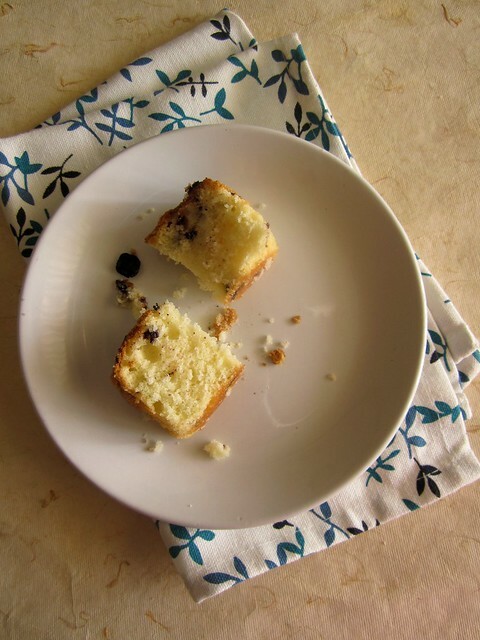 I love choco-chip and blueberry and am in love with this one.I have been baking quite a bit from your blog and my fav is the eggless apple cake. Hai,first congrats for ur blog 5th anniversary.i love to bakes more as i am a begineer in it,ur step by step procedure helps me lot,i love all baked recipes. i made it, iwas a great hit.. thanku for posting such beautiful recipes..
Hello Divya and Congratulations on cooking/baking and sharing for 5 years!!! I personally loved your Death by chocolate cake and have made a number of times since then. 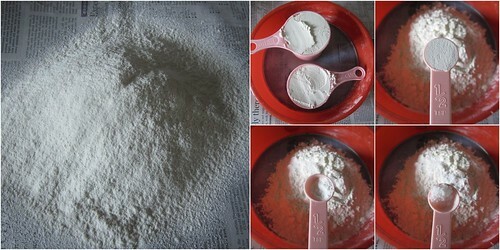 Am so loving this tried and tested buttermilk cake recipe. Congrats....Yumm....very soft and tempting cake..
Hi Divya.. My favourite recipe from your blog is the CoffeeChocolate shortbread which i haf made so many times.. Thanks to you i haf tried on so many of your cakes n cookies recipes.. Keep up the good work..
Saying Hi to your glamorous cake is easy enough - being eligible for a giveaway is 'icing on the cake' :-) Since I only bake eggless, am going to try this with mashed banana and curd as substitutes, hope ti works. Having said that, I'm hopping off to your bakes section for more..
some of them i tried and few i have bookmarked too anyway the way of pictures and steps u post r really good . I became a great fan of urs and iam just hoping u to do posts in the same way ...congrats once again. I have never seen dried blueberries here, love the soft texture of the cake too. Divya, I baked my first cake ( a simple chocolate one) following you recipe and havent looked back hence. Choosing my favorite here would mean sorting through so many recipes ( baked or otherwise) that I have tried. The Nan khatai: its my go to recipe and I love it and so does any one who has tasted it till date. Mango Chundo is my favourite in your blog..I was literally drooling looking at the picture. Hello Divya, Best wishes to you for your 5th successful blogging years. I really love the receipes you post in your blogs. They are superb and I have tried many. I special request to you for this happy occassion. Please please post the fruit biscuit receipe of the famour Karachi Bakery of Hyderabad. Those are heaven. please. I am looking forward to as you are the only hope for me. Let me first say that I love your blog!!! I have used several of your recipes, especially the south Indian rasam and sambar recipes. Hey Divya, I am one of the silent readers/admirers of your blog. I remember how often I would keep checking your blog coz your step by step recipes just made cooking seem so easy. There was this one time...I was going through your blog at my internship and one of my co-interns asked me..hey do you have a cooking blog of your own (he got confused due to the similarity in names) :). I keep on inspiring my sister who is also a housewife as to how all ladies like you are the super women of the food blogging world. For me one of my fav recipes is the Herb and Cheese Pull apart bread... the way you have created that masterpiece (yes I am totally in love with baking)..is just out of the world...and also kudos to your patience...in baking those lovely crossaints. Thanks to u..it feels that every person passionate to cook can make all these items that look so complex. So yummy yum! Wish I had a piece of cake right now. Hi Divya... this looks awesome... 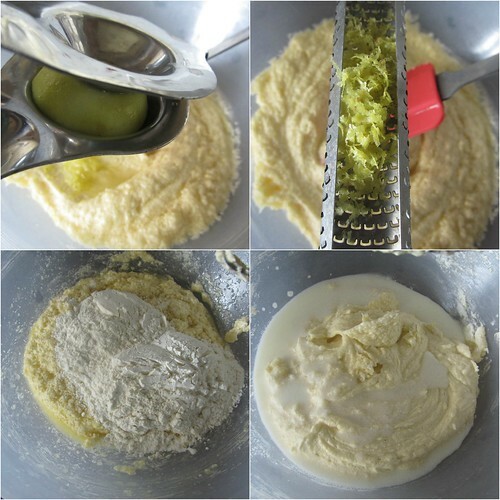 I am an regular reader of your blog... one of the above pictures made me curious and I thought of checking with you... would u be kind enough to let me know where have you bought the lemon zester from? I am looking for the same but cant find it... your input will be very much appreciated... Thanks! I got the Microplane Zester from US through a kind friend who was coming down to Chennai.Have seen something similar in Big Bazaar,though not the same brand I think it will work out well as a substitute. Hi Divya, this one looks delicious... 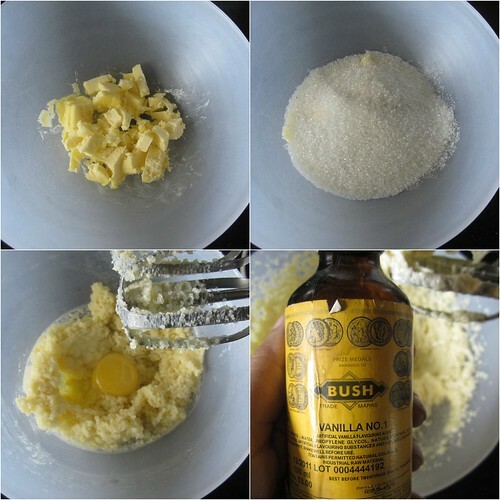 I need to try this one but a I am a vegetarian so cannot use EGGS, which ingredient can replace eggs and what quantity?